Even according to the most generous assessment, it was an accident waiting to happen. The heating and purifying of trinitrotoluene – TNT – was more dangerous than the manufacture of the explosive material itself. But a crippling shortage of shells on the frontline in the First World War demanded a solution, whatever the compromises, whatever the risks. Chemical company Brunner Mond & Co, which ran a factory in Silvertown, had such spare capacity. Built in 1893, the plant had produced soda crystals and caustic soda but work had ceased in 1912 and its buildings were under-utilised. In 1915 the purification of TNT, in effect, came home. For it was Brunner Mond chief scientist Francis Freeth who had invented the process, which, he conceded, was “manifestly very dangerous”. And so, in the middle of a densely populated area of east London – now the site of the new Royal Wharf development – an impromptu munitions factory appeared, virtually out of nowhere and against the wishes of its chief scientist and the Brunner management. Some 10 tonnes a day were purified in one of many factories producing noxious chemicals and hazardous materials in this area of the East End – although Brunner Mond was by far the most vulnerable and dangerous. Fate determined that January 19, 1917, would be that fatal moment. At 6.52pm following a fire in the melt-pot room, 50 tonnes of TNT exploded. The plant was immediately flattened as were all buildings within 100m. But the impact of the explosion reacher further than anyone in London had ever experienced, leaving a “blood red sky” across the capital for hours. The explosion was remarkable for its ferocity and its capacity to destroy. The factory disappeared. Tens of thousands of houses were flattened. Red-hot debris was flung miles from the site triggering secondary fires. A gasholder on the Greenwich Peninsula exploded, created a massive fireball feasting on 200,000 cubic metres of gas. Warehouses were destroyed as were the goods within seven hectares alongside the Thames. 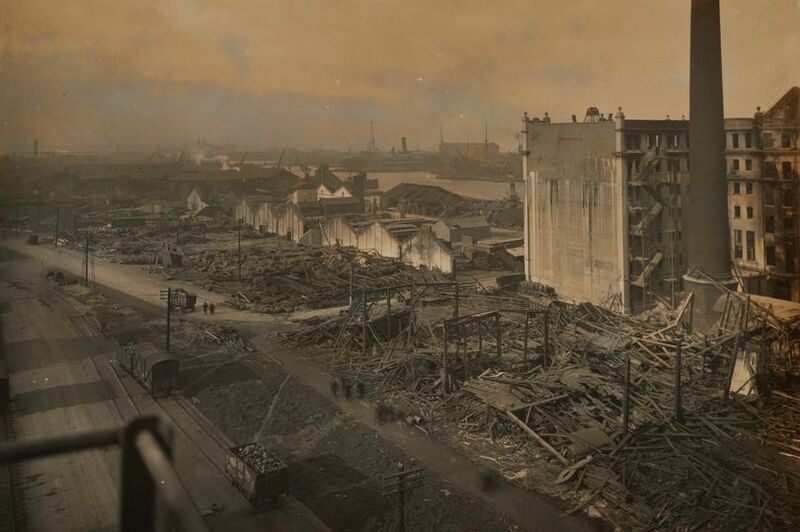 The Millennium Mills and flour silos, neighbouring Royal Victoria Dock, were badly damaged. The locality became a scene of wreckage and devastation to match anything witnessed on the Western Front. The buildings that were still standing were left with jagged brickwork like broken teeth. Vertical struts of metalwork that had been the skeletons of huge warehouses held their form but were snapped like branches where the blast had struck. Buildings were toppled and disfigured, creating a flattened apocalyptic wilderness of fractured and fragmented masonry. The new fire station was severely damaged. Schools were reduced to rubble. The St Barnabas Church was holed; the parsonage acting as a makeshift soup kitchen. In one home the body of Ethel Betts, aged only four months, was recovered. But the blast was not contained within Silvertown. Reportedly, the explosion blew the glass out of windows in the Savoy Hotel and toppled a taxi in Pall Mall. Fires could be seen in Kent and Surrey and the blast was heard up to 100 miles away, at Sandringham in Norfolk and along the Sussex coast. The most remarkable feature of the explosion, beyond its scale, was the death toll. The factory sat in the midst of a residential area with 3,000 people living within a quarter mile of the plant. Tens of thousands of homes were damaged yet the death toll was 73. The timing of the blast was crucial. Many people were between shifts, meaning the factory was nearly empty, and it was a time of day when few were in the upper storeys of their homes, which took the full force. There were stories of horror and heroism amid the rubble and shock. Keith Lloyd recalled how his grandfather Ernest Lloyd, 35 at the time, told him about the aftermath of the blast. “Suddenly it happened. A huge pink semi-circle cloud appeared in the sky, bigger then any of the surrounding buildings. The top of the semi-circle opened to send red, yellow and black smoke belching upwards. “I remember thinking ‘the sun must have fallen out of the sky.’ I turned to run but there was an enormous explosion and I felt myself being lifted as if by a giant hand and propelled forward at terrific speed. My ears were full of rushing wind. “Then, as suddenly as it started, it stopped and I felt my body drop and hit the roadway very hard. I lay still. Then, lifting my head a little, I could see people being blown about. “Three women who had been walking towards me were suddenly mown down. One leaned against the shutters of the butcher’s shop looking down where her hand should have been. The statistics told the story of the horror. As well as the 73 who were killed, more than 400 were injured. More than 70,000 properties were damaged with more than 900 beyond salvage. Damage worth tens of millions of pounds in today’s money. Firefighters and volunteers were killed or seriously injured, many caught in the blast while trying to quell the flames of the initial fire. Rescue work was hampered because of the warren of tight streets. Andrea Angel, the plant’s chief chemist, was posthumously awarded the Edward Medal (First Class) as was George Wenbourne. They were both killed “endeavouring to save the lives of others”. PC Edward Greenoff was posthumously awarded the King’s Police Medal and is commemorated with a plaque on the Memorial to Heroic Self Sacrifice in Postman’s Park, in the City. PC Greenhoff’s son, eight at the time of his father’s death, would later become a police officer himself. The area was mostly rebuilt – within a month 1,700 were employed in building work and completed by August. There had been debate in Parliament that the living conditions were so poor that the explosion provided an opportunity to move people out to a new garden city. It never happened although many children were sent away to the countryside to recuperate from the trauma and £3million was paid out in compensation (equivalent to £250million today). An investigation led by Sir Ernley Blackwell could not find a single cause for the explosion. In the absence of evidence, rumours had been circulating about German sabotage and German businesses were targeted in reprisal attacks but Sir Ernely found no evidence for the claim. Instead, the report criticised the safety of the plant and accused Brunner Mond of negligence in its reckless handling of the TNT. The report concluded that Silvertown was a totally inappropriate place for a makeshift, muddled munitions factory. Freeth himself, writing in 1962, said he had repeatedly reminded the Silvertown plant bosses that the plant was under constant threat of explosion, but he was told that it was “worth the risk”. It was, in short, an accident waiting to happen. The Blackwell report into the biggest explosion London has ever seen remained secret until the 1950s.